LB Azeem Victor, again the force leader in the middle of a Washington defense holding opponents to an average of 14 points a game, has added game intelligence to his considerable physical skills. Azeem Victor is a man who needs little introduction to those familiar with Pac-12 Conference football. Every Saturday, however, Victor makes sure he introduces himself, at maximum velocity, to opposing running backs, receivers and quarterbacks. To call the 6-foot-4, 230-pound junior linebacker from Pomona, CA High School a wrecking ball would be a disservice to Victor’s smarts. While he hits well above his weight, it’s his brain that puts him in places to deliver the crunching tackles with which he made a name for himself during the 2015 season. He was the force leader on the Pac-12’s No. 1 defense a year ago– a team-high 95 tackles, nine for loss, and forced two fumbles. An honorable mention all-league selection who was voted the team’s Tough Husky award, Victor said that chief among his improvements this season is his ability to read the game. Add that to a pursuit motor that runs down targets anywhere on the field, and the Huskies have a leader for a defense that is again putting the Pac-12 on lockdown. Victor, fifth in the Pac-12 with 7.7 tackles per game, knows it’s not a one-man show. Victor and friends limit opposing offenses to about 14 points per game. The offense, meanwhile, puts up an average of 49.5 points. It’s a formula that has produced a purple hurricane each weekend, except for this one, a bye. 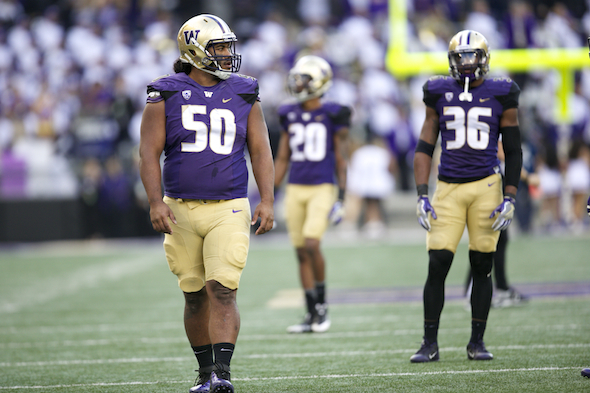 Washington’s front four boasts three 300-pounders in Greg Gaines, Vita Vea and Elijah Qualls. With size and strength up front, coach Chris Petersen said the defense doesn’t need to blitz as often, allowing Victor and the secondary more room to make plays. “Those guys up front have to first and foremost do their jobs and cause some havoc,” Petersen said. “It makes those other guys really able to play fast. Then it’s that cat-and-mouse game: How much do we blitz? Do we need to blitz? Asked if the lack of blitzing, many a linebacker’s favorite activity, disappoints him, Victor laughed. DB Kevin King said Victor has the ability to elevate the entire team. With 46 tackles through six games, Victor is on pace to match last season’s stats, which has many wondering if the junior might make the jump to the pros. Victor said that it was too early to say, but was thrilled to stick around after practice and watch the Atlanta Falcons, in town and using Husky Stadium as a practice facility for the week ahead of their Sunday match against the Seahawks. “It’s awesome to have NFL guys out here,” he said, grinning. Soon enough, Victor will have his pro chance. But Petersen and the 6-0 Huskies are thrilled to have him for a second season anchoring the middle of Washington’s best chance in 15 years for a Pac-12 championship. When QB Jake Browning ran the ball over the goal line for the first score of a 70-21 bludgeoning of Oregon Oct. 8, adrenaline got the better of him. He pointed a finger toward the face of the nearest defender, earning a 15-yard penalty for taunting. Browning, who usually conforms with Petersen’s policy of hyping only teammates and opponents, momentarily lost his head. The sophomore threw a school-record six touchdown passes and ran for two more. He may look back on the moment with flushed cheeks — and tired arms. Petersen’s punishment was ordering Browning to do 500 pushups during practice this week. But his teammates loved the gesture so much they volunteered to do some pushups for him. To no avail. Victor, known for a fiery on-field personality, said the moment was huge for him. “I haven’t seen that out of Jake,” Victor said. “That was the highlight of the day for me. For an offensive player to show that, that shows our frustration. It’s been 12 years since we beat those guys. King echoed a similar sentiment. “Coach Pete didn’t like it too much, so when something like that happens a guy gets 500 push-ups,” King said. “Everybody raised their hands and said we’ll do some of them with him. We stand behind Jake, we have a quarterback who’s a fighter.